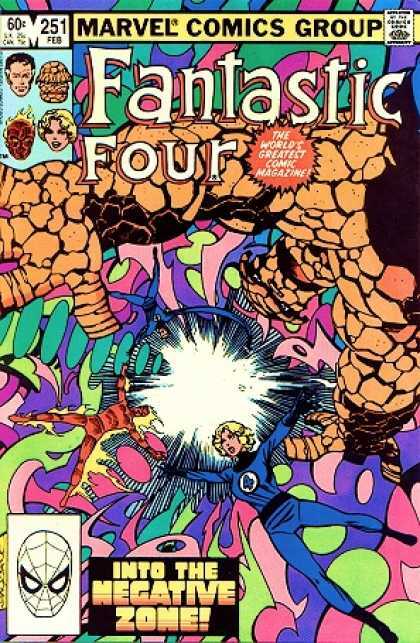 The Fantastic Four was my first permanent hook into comics. It was a great book, filled with everything that I was looking for in my entertainment. There was one thing, though, that... I don't want to say "puzzled" but it never seemed to sit quite right with me. When people talked about the essence of the Fantastic Four, they always said it boiled down to "family." That always struck me as an odd notion because "family" -- as it was generally defined in the 1970s and '80s in America -- was Dad and Mom with their 2.5 kids. Which the Fantastic Four clearly were not. People would use the Thing and Human Torch as euphemisms for the kids, but that always seemed a bit of stretch for me. Sure, they acted juvenile on occasion but I saw them as adults who just weren't as serious as Mr. Fantastic. I looked at the relationships there as they were presented. Reed and Sue were married. Johnny was Sue's brother, but had no real relationship to Reed. And Ben was just a friend of everybody's. And then you had these orbiting friends who stopped in frequently like Alicia Masters and Wyatt Wingfoot and Crystal, who weren't actually related to anybody, but everybody knew and liked. What that did for me, back in the day, was re-define "family." It didn't mean Dad, Mom and the kids. It didn't have anything to do with blood relationships or marriage vows. Family was the people you loved and spent the majority of your time with. The notion of a stereotypical nuclear family didn't make sense in the context I was seeing it. Family was defined by the individual. That concept took deeper root with me as I continued reading the book. The Thing was replaced by She-Hulk. Ben returned, but Reed and Sue left to be replaced by Ms. Marvel II and Crystal. When Reed and Sue came back, Ms. Marvel stayed on as a fifth member, much like Nova II had done years earlier. It reflected life in that individuals move in and out of your circle over the course of time -- sometimes for extended periods, sometimes shorter ones. But you embrace those who you care about, bring them into your home and make them a part of your life. Your family. And isn't that how all families work at some level? Maybe your brother comes to live with you while he's looking for a new job or you spend all your free time with your co-workers or you maintain close ties with your armies buddies for years after you're out of the service. That's family, right? Maybe not a direct blood-line between people, but a direct emotional connection. So how is gay marriage any different? They're just trying to make a family like the rest of us. No, it won't be Dad, Mom and 2.5 kids but that rigid definition was never really even valid in the first place. That's one of the themes I picked up from The Fantastic Four and something I go out of my way to look for in other fictions, and something I'm always striving for in my real life. Well, lookie here! I plug the search term "Fantastic Four" into Facebook and look what comes up! I'm going to have to save and forward this one. I actually noted the gay reference in Fantastic Four #251 when it was first released in 1982, but I had no idea at the time that it was the first reference to gay life or identity in a mainstream super-hero comics. It was, however, the first one that I noticed, and I mentioned this to my friends at The Gay League (www.gayleague.com). It may have turned up on their former Website because of my mention. Inquire of the Gay League Moderator, Joe Palmer, about this if you like. You should be able to contact him through the site. Nice write-up. On a total tangent, I've always been a great fan of Mary Tyler Moore, a series into which people also read gay themes in relation to family; i.e., a family being something that you create out of people you care about, rather than something that you're born into. Here's a link to the scan of the panel(s) in question from FF #251. AFAIK, it is the first use of "gay" to mean homosexual. I've found "gay" as in happy or carefree in Girls' Love Stories #49 from 1957.